Teeth agenesis is the most prevalent craniofacial congenital malformation in humans. Missing teeth is described in literature by various terms such as oligodontia, anodontia, and hypodontia. While tooth agenesis may be associated with several syndromes, nonsyndromic oligodontia refers to the congenital absence of more than six teeth in the absence of any other deformity. Studies in molecular genetics have made it possible to identify the exact genes responsible for the development of teeth and trace the mutations that cause oligodontia. 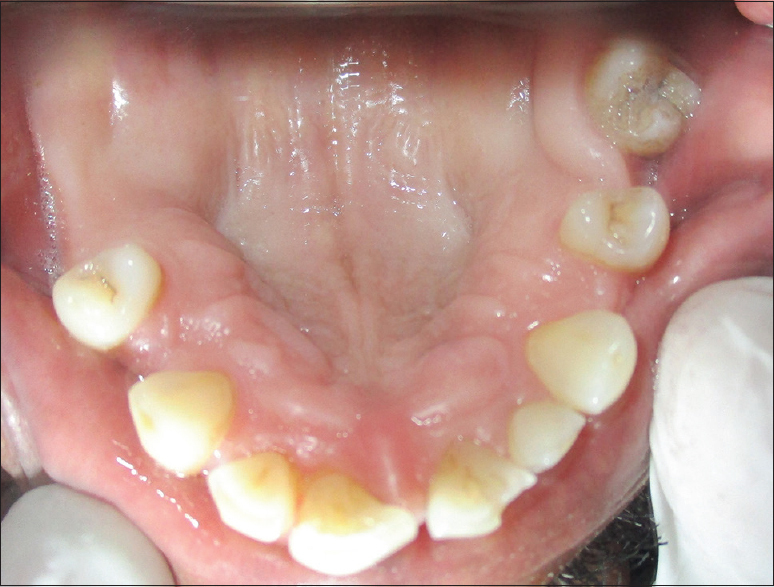 The present case describes agenesis of permanent teeth which are familial and with no apparent systemic abnormalities. Dental agenesis is the most prevalent craniofacial congenital malformation in humans. It is categorized based on the number of missing permanent teeth, excluding the third molars. The complete absence of teeth is expressed as anodontia, hypodontia is missing of one to five teeth, and oligodontia is when six or more teeth are missing. Oligodontia can occur either as an isolated condition (nonsyndromic oligodontia) or it can be associated with cleft lip or palate and other genetic syndromes (syndromic oligodontia)., The exact etiology of oligodontia is unknown. Agenesis of permanent teeth ranges from 1.6% to 9.6% depending on the study population. Its prevalence progressively decreases as the number of missing teeth increases in oligodontia, with an overall prevalence of 0.1%–0.4%. More commonly encountered in females than in males with no difference in the distribution of missing teeth over maxilla/mandible and left and right sides. Nonsyndromic oligodontia is a relatively rare condition, with an incidence as low as 0.08%–0.16% and associated with mutations of the MSX1and PAX9. Oligodontia can occur in association with syndromes, such as ectodermal dysplasia, incontinentia pigmenti, Down syndrome, and Rieger syndrome or as a nonsyndromic isolated familial trait, or as a sporadic finding. When oligodontia is associated with a syndrome there may be abnormalities of the skin, nails, eyes, ears, and skeleton. Patients with oligodontia may present with psychological, esthetic, and functional impairment., The genetic basis of oligodontia is a topic that has been keenly studied by investigators ever since earlier studies have shown that hypodontia and oligodontia tend to run in families. However, identifying the exact genes responsible for the development of teeth and tracing the mutations that cause oligodontia has been achieved. 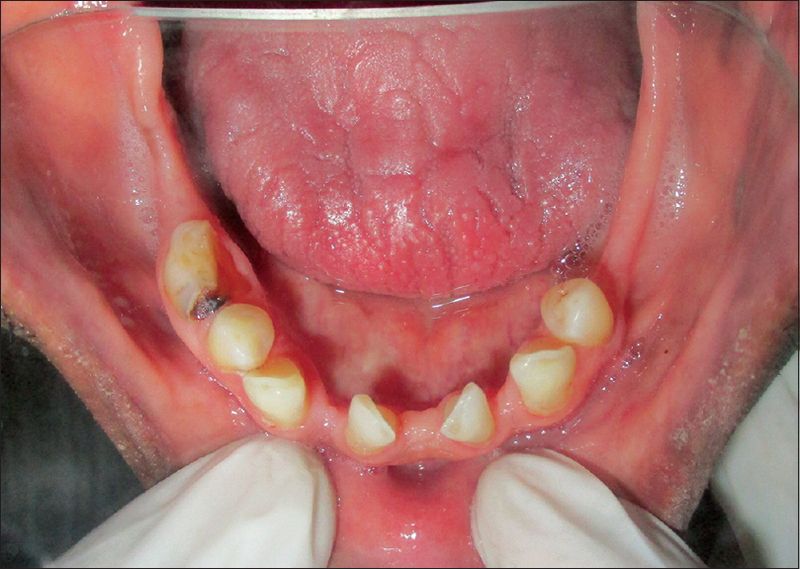 We report two cases of nonsyndromic oligodontia in the same family. A 28-year-old female patient reported to our department with chief complaint of pain in the right lower back tooth region for the past 2 days. Clinical examination revealed multiple missing teeth in both upper and lower arches with no history of extractions in the past. Born to a nonconsanguineous marriage and normal delivery, a similar finding was elicited in her accompanying father. 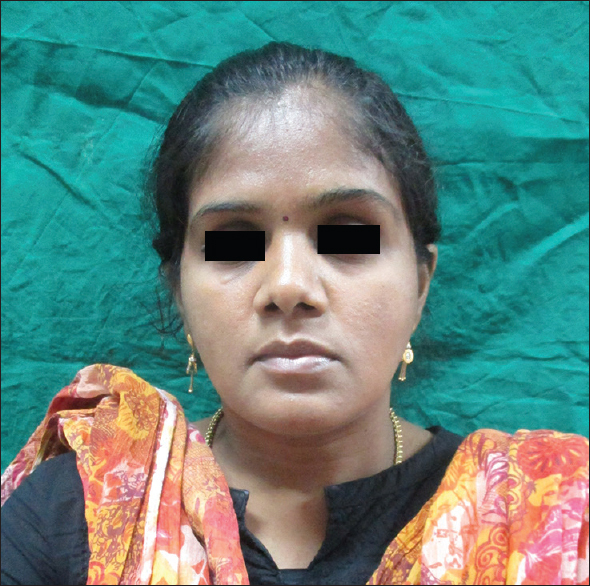 She was normal in her facial appearance and did not show any physical or skeletal abnormalities [Figure 1], to an effort to rule out syndrome associated changes. Ophthalmological and neurological examination of the patient was noncontributory. On clinical examination, a total of 18 teeth present, out of which 10 in maxillary arch and 8 in mandibular arch [Figure 2], [Figure 3], [Figure 4]. Varieties of dental abnormalities were present in both arches which include irregular spacing, midline diastema, and missing teeth and retained deciduous teeth. The edentulous area appears to be knife-edged. 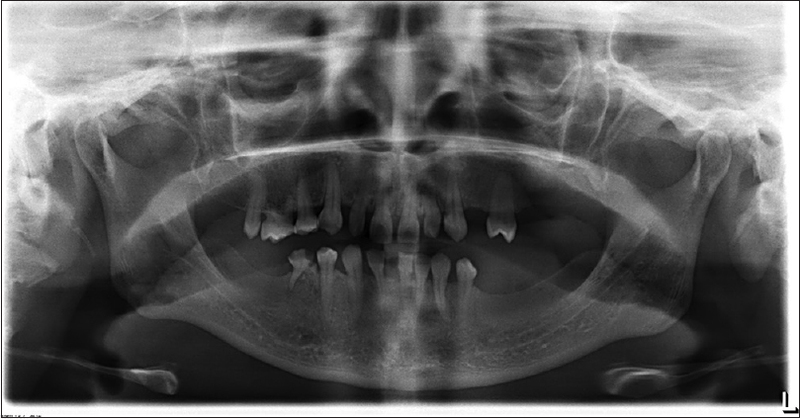 Orthopantomogram (OPG) of the patient confirmed the number of teeth with no impacted permanent teeth [Figure 5]. 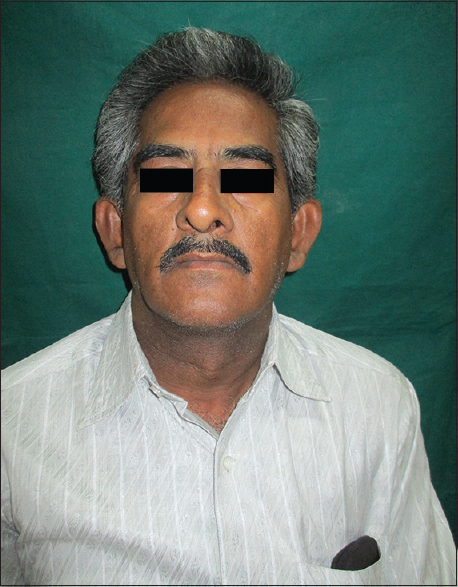 Patient's father, aged 60 years, too has missing teeth in both upper and lower arches since birth. His family history revealed that his mother, two brothers and their daughters also have multiple missing teeth [Figure 6]. His physical examination was too noncontributory. Intraoral examination revealed a total of 16 teeth [Figure 7], [Figure 8], [Figure 9], [Figure 10], out of which 9 teeth were present in maxillary arch, 7 teeth in mandibular arch. As seen in our patient, multiple dental abnormalities were evident which include irregular spacing, missing teeth and retained deciduous teeth and edentulous areas appears to be knife-edged. His OPG findings too confirmed the clinical examination [Figure 11]. Based on the history, clinical findings and radiological findings a diagnosis of nonsyndromic familial oligodontia was made. Both the patients and her father expressed their anxiety over this dental abnormality; we briefly explained a possible genetic transmission from one generation to the next. With their willingness and consent, we proposed to perform a genetic study in an attempt to identify candidate gene mutations known to be associated with oligodontia with varying degrees of expression in their family. Following an informed consent, genomic DNA was isolated from the peripheral blood of the patient by modified salting out method. The target region in the PAX9 gene was amplified using the following primers; Forward 5'–3', Reverse 5'–3'. The amplicons were analyzed through PCR using BigDye terminator (v. 3.1) cycle sequencing kit (Applied Biosystems) on an ABI 3730XL DNA sequencers. Three single nucleotide polymorphism markers of the PAX9 gene [Table 1] were genotyped. A few polymorphisms, namely, A271G, A340T, and C433T, in exon 2 of PAX9 gene were screened in this patient to elucidate the putative role of this gene as a possible etiological factor for oligodontia. The sequence chromatograms revealed the presence of homozygous wild-type allele in all the three mutation sites screened [Figure 12]. Congenitally, missing teeth may also result from numerous, independent pathological factors that can affect the orderly formation of the dental lamina, the failure of a tooth germ to develop at an appropriate time, the lack of necessary space imposed by a malformed jaw and a genetically predetermined disproportion between the tooth mass and the jaw size. Familial hypodontia or oligodontia represents an absence of the varying numbers of primary and/or secondary teeth as an isolated trait. While much progress has been made in understanding the developmental theory of tooth formation, the knowledge on the possible etiological factors of the inherited tooth loss remains still a clinician's enigma. Although heredity is the main etiological factor, several environmental factors such as virus infections, toxins, and radio or chemotherapy may also cause missing of permanent teeth. However, most of the cases are caused by genetic factors. Familial tooth agenesis is transmitted as an autosomal dominant, recessive, or X-linked trait. Nonsyndromic tooth agenesis has wide phenotypic heterogeneity and is classified either as sporadic or familial, which can be inherited in an autosomal-dominant, recessive, or X-linked mode. Oligodontia as well as hypodontia are highly heritable conditions associated with mutations in the AXIN2, MSX1, PAX9, EDA, and EDAR genes as shown in [Table 2]. The pattern of tooth absence is influenced by the gene affected, as well as the type of mutations within the specific gene. Affected members within the family often exhibit significant variability with regard to the location, symmetry, and number of teeth involved., According to the phenotype of the previously published PAX9 mutations, the most often affected teeth were molars and second premolars. Grahnen has suggested that tooth agenesis is typically transmitted as an autosomal dominant trait with incomplete penetrance and variable expressivity. In his sample, the penetrance was higher when the proband of the family had more than 6 missing teeth. Graber, while reviewing the congenital absence of teeth, he reported that it is most often transmitted in an autosomal dominant pattern with incomplete penetrance and variable expressivity and thus resulting in one or more point mutations in a closely linked polygenic system. The congenital absence of teeth is a complex condition affecting several parameters of oral development. A study which was done to measure tooth crown dimensions using image analysis in a family with hypodontia, in whom the mutation was identified, and compared them with a control group. The majority of teeth size and shape throughout the dentition were significantly smaller in the family members with hypodontia than in the control group, for all parameters which were measured. The significantly smaller tooth crown dimensions which were recorded in the affected family members showed that the effect of the PAX9 mutation was seen not only in the congenitally missing teeth, but also in smaller crown sizes throughout the dentition. Complex interplay between genetic and environmental factors plays a crucial role in the development of dental anomalies. Numerous studies have reported mutations and polymorphisms of PAX9, MSX1, AXIN2, and EDA genes in nonsyndromic cases of oligodontia. PAX9 [Figure 13] is a transcription factor expressed during tooth development in the dental mesenchyme. It is known to regulate the cellular pluripotency and differentiation during embryonic patterning and organogenesis. Any defects in this gene have been associated with agenesis of permanent molars, including maxillary first and second molars, and mandibular second molars. Since the patient was concerned to know about the familial occurrence of oligodontia, a partial DNA sequencing was performed which spans a few mutations, namely A271G, A340T, and C433T, (Tallón-Walton, 2014) in exon 2 of PAX9 gene. Hence, a comprehensive exome sequencing including the intron-exon boundaries of the PAX9 gene along with other important genes could be considered to further confirm its association with oligodontia in the proband. 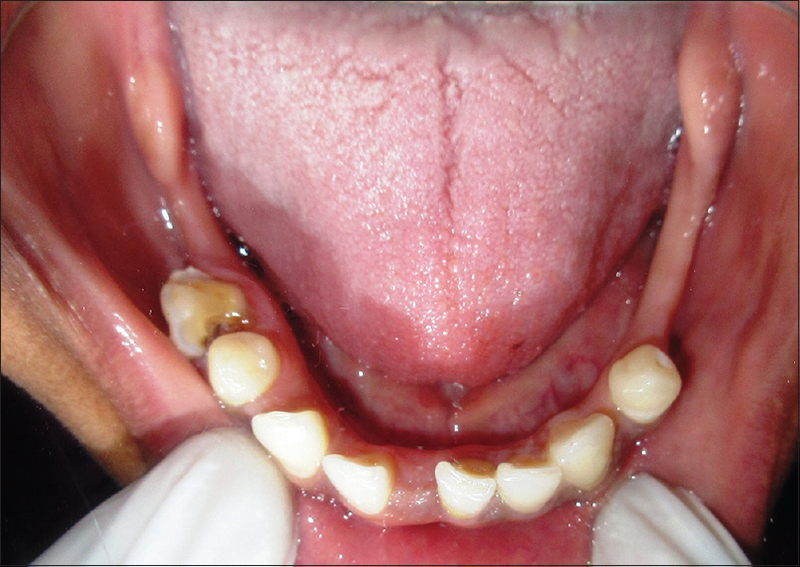 The management of nonsyndromic oligodontia will require a comprehensive rehabilitation in an attempt to improve both functional and esthetic enhancement. In addition, the psychological state of the patient will require a paramount importance to boost the self-confidence. The prosthetic workup will include removable partial dentures, fixed partial dentures, cast partial denture, overdentures, and implants. The choices will dependent on the condition of the remaining teeth and alveolar bone morphology. Our patient underwent a cone beam computed tomography imaging to evaluate the bone density followed by implant placement in the posterior teeth. Teeth agenesis is not an uncommon finding; it can be nonsyndromic or a part of a genetic disorder. Early detection and intervention can improve the process of rehabilitation. A detailed clinical history and evaluation will give us the path of inheritance. This can be followed by a genetic study in an attempt to isolate the gene responsible. Mutations observed in PAX9, MSX1, and EDA can be considered as preliminary test; however, other genes AXIN2, EDAR needs to be studied to implicate its role in the process of odontogenesis. 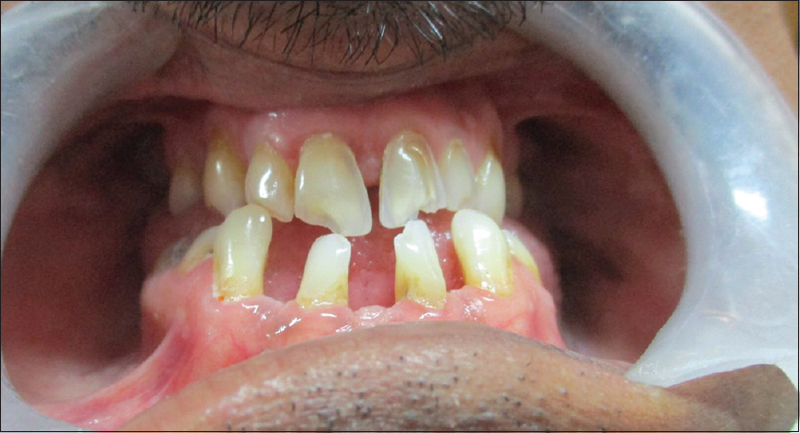 Gupta D, Kamal M, Sharma H, Gupta S. Idiopathic non syndromic oligodontia in permanent dentition: A case report. Indian J Dent Sci 2012;4:67-9. 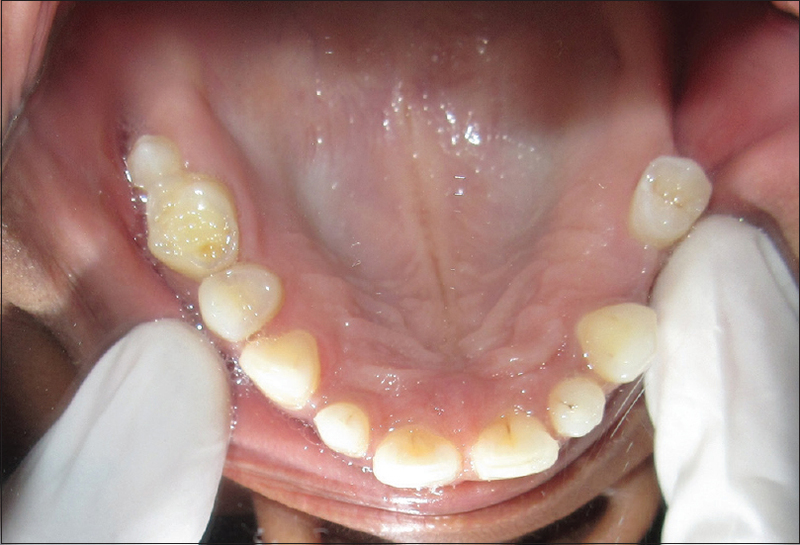 Bajaj P, Sabharwal R, Joshi S. Nonsyndromic oligodontia: A rare case report with review of literature. DJAS 2014;2:109-12. 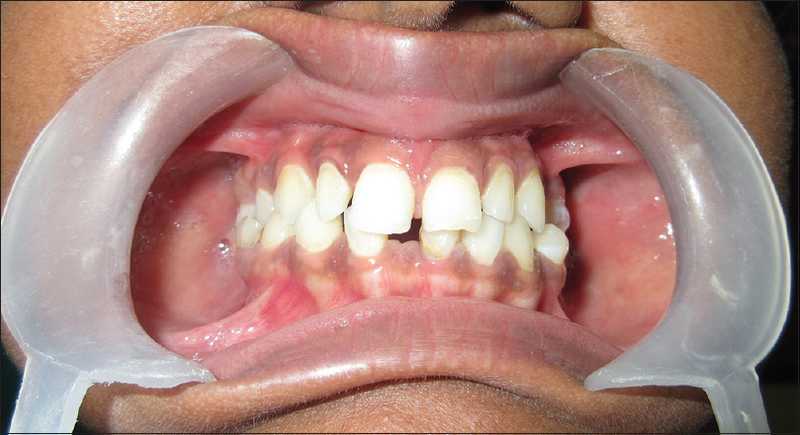 Dali M, Singh R, Naulakha D. Idiopathic nonsyndromic tooth agenesis: A report of rare three. J Interdiscip Dent 2012;2:191. Basoya S, Koduri S, Gupta I, Chandar VV. Familial non-syndromic oligodontia. J Indian Acad Oral Med Radiol 2015;27:437-40. Gorlin RJ, Cohen MM, Levin LS. Syndromes of the Head and Neck. 3rd ed. New York: Oxford University Press; 1990. p. 1119-23. Neville BW, Damm DD, Allen CM, Bouquot JE. Oral and Maxillofacial Pathology. 3rd ed. Philadelphia: Saunders; 2009. p. 77-80. Tallón-Walton V, Manzanares-Céspedes MC, Carvalho-Lobato P, Valdivia-Gandur I, Arte S, Nieminen P, et al. Exclusion of PAX9 and MSX1 mutation in six families affected by tooth agenesis. A genetic study and literature review. Med Oral Patol Oral Cir Bucal 2014;19:e248-54. Biradar VK, Biradar S. Non-syndromic oligodontia: Report of two cases and literature review. Int J Oral Maxillofac Pathol 2012;3:48-51. White SC, Pharaoh MJ, editors. Oral Radiology Principles and Interpretation. 5th ed. Mosby Elseiver, 2004. p. 332. Rajendran R, Sivapathasundharam B, editors. Shafer's A Textbook of Oral Pathology. 5th ed. New Delhi: Elsevier Publication; 2007. p. 64. Pani SC. The genetic basis of tooth agenesis: Basic concepts and genes involved. J Indian Soc Pedod Prev Dent 2011;29:84-9. Brook AH, Griffin RC, Smith RN, Townsend GC, Kaur G, Davis GR, et al. Tooth size patterns in patients with hypodontia and supernumerary teeth. Arch Oral Biol 2009;54 Suppl 1:S63-70. Matalova E, Fleischmannova J, Sharpe PT, Tucker AS. Tooth agenesis: From molecular genetics to molecular dentistry. J Dent Res 2008;87:617-23. Wang J, Xu Y, Chen J, Wang F, Huang R, Wu S, et al. PAX9 polymorphism and susceptibility to sporadic non-syndromic severe anodontia: A case-control study in Southwest China. J Appl Oral Sci 2013;21:256-64. Vastardis H. The genetics of human tooth agenesis: New discoveries for understanding dental anomalies. Am J Orthod Dentofacial Orthop 2000;117:650-6.